After the crowds of Valencia and Las Fallas it was a relief to be on the road again. We headed west toward La Mancha, home of Cervantes and his Don Quixote in the Tierra de Gigantes (Land of Giants). 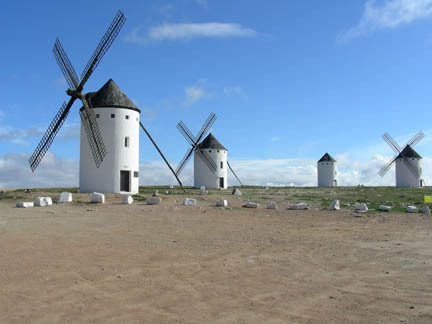 Don Quixote was a slightly confused Spanish knight of about the 16th century who fought giants in this area, only his giants were really windmills. We traveled through small towns and open farmland on a flat plain at about 2,000 feet above sea level. The country was beautiful and lush with small white houses with red tile roofs scattered across the area. 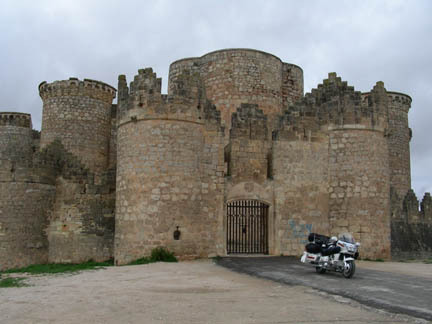 Our first stop was for lunch at a town with a Moorish style castle. 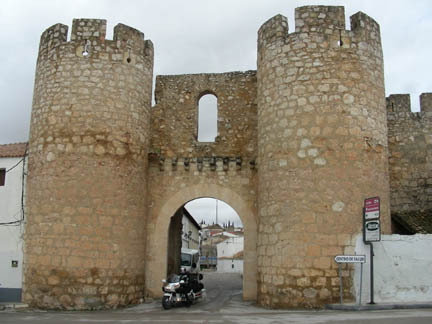 It also had a stone arch for the entrance to the old part of town. Then on to the windmill country where we spent the night in a small hotel that was as nice as the one in Valencia, for half the money. 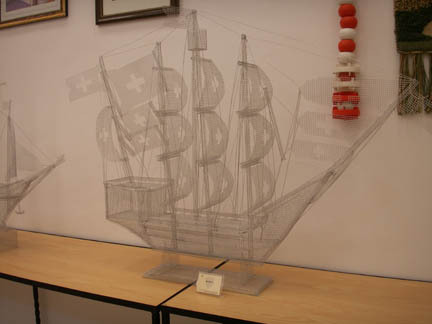 In this town was a museum of wire sculpture that was very interesting. They took wire cloth and made all sorts of complicated forms out of it. 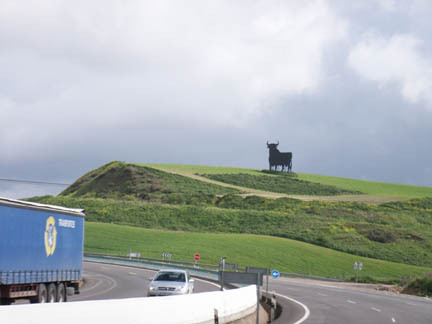 The next day we took the divided highway with the huge cutouts of black bulls on the hilltops and rolled away the miles toward Seville. In a small town just west of Seville we stayed at a Hostel with only single beds. We had three in our room so we pushed two together and slept fine. Then it was on to Sagres, Portugal. Sagres is on the very southwestern tip of Portugal. 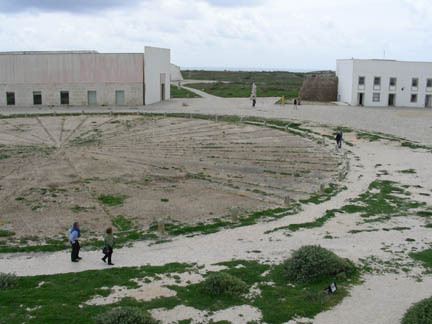 There is a fort there with a large (100' diameter) compass rose that is where Prince Henry the Navigator had his navigation school. It is because of him that Portugal could sail so far so accurately that they dominated the sea world during his time.